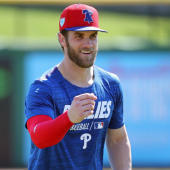 Herrera (hamstring) isn't included in either of the Phillies' split-squad lineups Thursday for Grapefruit League games against the Pirates and Ray. The Phillies have taken things slowly with Herrera over the past three weeks while he's tended to a strained left hamstring, but the 27-year-old could be on the cusp of returning to action. He was able to take at-bats in a minor-league game Wednesday and could make his next appearance in the Grapefruit League, most likely as a designated hitter. The Phillies remain optimistic that Herrera will be ready to go for Opening Day, when he'll likely settle in as the team's starting center fielder.